The clouded leopard looks like one of the "big cats" in miniature, having the powerful, robust build of a large cat. It has a head and body length of 82 - 99 cm (32 - 39") and weighs 11 - 19 kg (24 - 42 lb). Its coat is grayish or yellowish, with dark markings ("clouds") in shapes such as circles, ovals, and rosettes. The forehead, legs, and base of the tail are spotted, and the remainder of the tail is banded. The tail is long, the legs are stout, and the paws are broad. The clouded leopard is most closely associated with primary evergreen tropical rainforest, but it also makes use of other types of habitat, such as relatively open, dry tropical forest, mangrove forest, secondary and logged forest, grassland and scrub. The diet of the clouded leopard is thought to include a variety of arboreal and terrestrial vertebrates, such as orangutan, young sambar deer, barking deer, mouse deer, bearded pig, palm civet, gray leaf monkey, and porcupine. Fish, birds and poultry are sometimes taken. The clouded leopard is highly adapted for an arboreal life, but it has also been observed exhibiting terrestrial behavior. Similarly, although it is generally considered to be primarily nocturnal, it is sometimes also active during the daytime. The clouded leopard swims well and has been found on small offshore islands. Clouded leopards are believed to be solitary animals except during the breeding season. The clouded leopard is found from central Nepal in the eastern foothills of the Himalayas through southern China and most of southeast Asia to the islands of Sumatra (Indonesia) and Borneo (Brunei, Indonesia, Malaysia). Little is known about its status in any part of its geographic range, but recent records suggest a thin but widespread distribution. 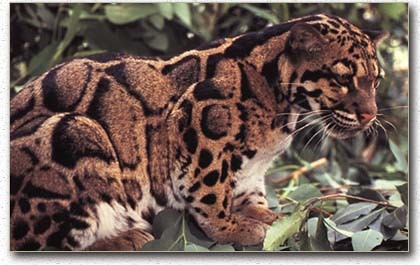 Deforestation, resulting from commercial logging and the growth of human settlements, is thought to be the foremost threat to the clouded leopard. Not only does deforestation remove the clouded leopard's own habitat, but it reduces the number of prey animals. Hunting of this cat for its fur and teeth as well as its bones, which are prized in the traditional Asian medicinal trade, is another major threat. The clouded leopard has also been featured on the menu of restaurants in China and Thailand which cater to wealthy Asian tourists, and it is sometimes persecuted for killing livestock. *** For its size, the clouded leopard has the longest canine teeth of any living cat (Sunquist & Sunquist 2002). Some call it the world’s only living saber-toothed cat (Humphrey & Bain 1990) . *** In Malaysia, the clouded leopard's local name means ‘branch-of-a-tree tiger' (Arkive 2005) . *** Clouded leopards are remarkably secretive creatures for their size (Nowell & Jackson 1996) . The clouded leopard’s total effective population size is estimated at below 10,000 mature breeding individuals (IUCN 2005) . The clouded leopard is found in the Himalaya, Indo-Burma, and Sundaland Biodiversity Hotspots (Cons. Intl. 2005). Clouded leopards reach sexual maturity by 20 - 30 months of age (Sunquist & Sunquist 2002) . The gestation period ranges from 85 - 109 days, but 88 - 95 days seems more typical (Sunquist & Sunquist 2002) . There is no evidence of a confined breeding season in the wild for the clouded leopard (Humphrey & Bain 1990) . Litter size in captivity is 1 - 5 kittens, most often 3 (7 of 9 litters) (Nowell & Jackson 1996) . There is little information on the interbirth interval of the clouded leopards because in captivity it is sometimes necessary to remove kittens from the den shortly after birth for hand rearing, and this may cause breeding to occur sooner than it would otherwise. Of four examples in captivity, on two occasions the interbirth interval was about one year, once it was about 16 months, and once 10 months (Sunquist & Sunquist 2002) . Clouded leopard cubs achieve independence at nine months (Arkive 2005) . 12 - 15 years (captivity) (Nowell & Jackson 1996) . A captive clouded leopard was still living at 19 years and 6 months (Nowak 1999) . In a study in Sumatra, Indonesia using photo-trapping, all but one of the pictures of the clouded leopard were obtained with a camera set to capture arboreal species (Holden 2001) . In Sumatra, Indonesia the clouded leopard was reported to become extremely cautious and exclusively nocturnal in areas close to human habitation (Santiapillai 1989) . During a study utilizing photo-trapping in the Gunung Leuser National Park in Sumatra, Indonesia, most photographs of the clouded leopard taken by camera traps were at night (Nowell & Jackson 1996) . Another study using photo-trapping in Sumatra, Indonesia showed that clouded leopard are mostly nocturnal but tended towards cathemeral activity in undisturbed areas (Holden 2001) . Clouded leopards swim well and have been found on small islands off of Borneo (Sabah, Malaysia) and Viet Nam (Nowell & Jackson 1996). Clouded leopard young are reported to den in tree hollows, but nothing else is known about rearing habits in the wild (Grassman et al. 2005). Clouded leopards are believed to be solitary animals except during the breeding season, when the males seek out the females (Arkive 2005) . Khao Yai National Park, Thailand: For one female clouded leopard, the home range was 33.3 sq km (12.8 sq mi), while a male used a home range of 36.7 sq km (14.2 sq mi) (Austin & Tewes 1999) .